We all have them, those moments in our lives where we are presented with a crossroad. Where each path has the potential to lead us into a totally different result. We all wish that we could fast forward to see which path is the best option, but, unfortunately, the only way to find out is to choose one. I had to make one of those decisions early on in my career. One of my earlier meetings in my career was with a gentleman who had an entrepreneurial spirit. He could see that in me as well, and had suggested that I check out the book “Rich Dad, Poor Dad” by Robert Kiyosaki. I can’t remember if I’d heard of the book at the time, but I was definitely intrigued. It was a time in my life when I would read any type of inspirational story and soak it up like a sponge! The author, Robert Kiyosaki’s father was extremely hardworking and stressed the importance of going to school, getting a degree and getting a good job. The other dad in his life was his best friend’s father, who was an entrepreneur and who had never graduated from college, but still found ways to make a very, very good living. As a child, Kiyosaki battled as to which dad had the better advice before finally realizing that his friend’s dad was not only much more successful, but also much happier in life. So Kiyosaki defaulted to his viewpoint. Reading that book, I had no idea that I would find myself in a similar experience. When I first started my career as a financial advisor, I was hired as a junior broker. That means I got paid practically nothing in salary – a whopping $18,500 a year – and then everything else I did was paid through a 50/50 split of commissions and fees with the advisor who hired me. Yes, I got paid dirt, but at the time, I was thankful to have a job. We were just coming out of the tech bubble, and new jobs were hard to come by. Getting in the business at a young age, I was comforted knowing that I had a base salary to depend on, but I also relished the idea of having the potential for unlimited income. The initial arrangement between my hiring advisor and myself was that I would go out and find “fresh meat” in the form of potential new clients, whether that be through cold calling, seminars, trade shows, or networking; basically, I was throwing anything against the wall and hoping it’d stick. Once I found a potential prospect, the goal was to bring them into the office,where the senior advisor would then conduct the meeting and essentially close the sale. For the first couple of months, the arrangement worked really well. But somewhere along the way, I got more confident and before I knew it, I was not only attracting new clients, but I was also closing them. The advisor that had hired me had good intentions of having a system in place, but we didn’t do a very good job of acting that system out. Anyone who has ever been in sales knows that if there is a prospective client wanting to meet with you, you meet with them, whether it’s at the office, at a local coffee shop or at their home – and you do it when it’s convenient to your prospective client! About halfway through my first year of being a junior broker, it was almost as if I was on my own. I didn’t really need help from the senior broker, other than just to run a few different scenarios by him. As my first year came to an end, my senior advisor had very little to do in the client acquisition process. As the year was concluding, we started to re-evaluate our arrangement. I remember it was a Friday afternoon, and he called me into his office. This was one of those meetings that I will always remember the rest of my life. We talked a little bit about how the arrangement had worked out and how, as his practice had grown, he felt that he needed more of an administrative assistant than an actual sales associate or junior broker. He then told me he felt that I had done a superior job and that I didn’t need him anymore. And although he would love to keep me on his team as his administrative assistant, he knew that it wasn’t in my blood. He knew that I needed to be my own advisor. I could stay on his team as administrative assistant and then he would give me a handsome raise in my salary. I could become my own broker. I would stop receiving my salary but I would retain all of the clients that I had brought in myself over the past year and then I would keep 100% of all my commissions and fees going forward. He told me to take the weekend to mull over the decision. Part of me already knew what I was going to do, but like any good son, I sought counsel. Over that weekend, I called my dad and my step-dad to see what they thought. 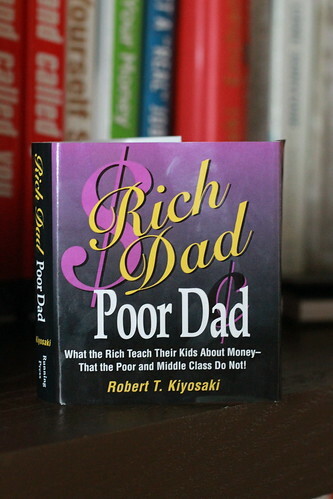 First a little background on each: My father was a lot like Robert Kiyosaki’s. My father had always preached to me to go to school, get a degree and find a good job; work hard and you’ll be successful. On the other hand, my step-dad also went to school, but instead of trying to find a safe, cushioned salaried job, he was always in sales. His belief was it’s always up to you to find out how much you can make. Knowing that they both had different points of views, I thought it would be extremely helpful to hear both sides. When I explained the two options I had, salary versus uncertainty, my dad suggested I take the salary. His rationale was I would have a stable, predictable income, and that I can gain some valuable work experience (remember, I was only 23 at the time) and after a few years, I’d feel more comfortable to branch off on my own. When I called and explained the options I had to my step-dad, I heard a much different point of view. He was thrilled at the idea of me being my own boss, and having some potential to truly make some serious money and have fun doing it. He knew this was my passion, and he had all the confidence in the world that I would be successful. I will never forget how excited he was for me. When I think about my experience, and I think of Robert Kiyosaki having the same experience of consulting both his dad and also his best friend’s dad on what direction to go, I feel like we were walking in the same shoes. It didn’t take long to figure out what the decision was. I was excited to share my decision, and Monday couldn’t get there soon enough! When the moment had finally arrived, I remember walking into my boss’ office, excited to share with him what I had decided. It was time to take control of my destiny; it was time to become my own advisor. I don’t think that he was surprised at all with my decision. I think he already knew which direction I was going before I even walked out of his office on Friday. Sometimes you just have to take a chance, follow your gut and just go for it. Have you had a tough life decision that you had to make that you knew would impact your life? How did you make the decision? Do you have any regrets? One thing that people that put up the choice of salary vs. self employment sometimes don’t mention is that if you have five years under your belt at a corporate job it may be very easy to project your future path. After less than five years I knew with a high degree of probability that I would be running the company in another 12 or 13 years. And with that fast rise in position I’d also be making high wages and bonuses. And I knew that it would be a crazy fun ride getting there. Now I was the only guy at my career level that was able to see that but because I did being an entrepreneur offered me very little chance of parity with what was already in my hand. For most of the other employees there, they had little to risk by leaving, but for me I had virtually guaranteed $ millions to stay put doing something I loved. No decision at all. In fact I worked way past financial independence just because it was a favorite hobby. It is generally very difficult to judge your profit potential in the entrepreneurship world. It also is impossible to determine ahead of time if you’ll enjoy it. I believe in taking educated risks but when you can have what you want without taking risk that is the smarter play I think. Unfortunately only a few people land in jobs with this kind of likely future apparent to them. Great story, I am about to leave a job I have had for 10 years and start a business that seems to have become a unknown talent.It is a little bit frightening But I am also excited and stories like that make me feel like it is possible. Awesome story man! I have a dad very similar to Roberts real dad. I have been laid off twice as a teacher and am currently starting my own blog and real estate business on the side while I work as a janitor at nights. It was a scary crossroad but telling my dad I wasn’t going back into teaching but instead starting my own business seems like the right thing to do! Good luck to you! Great story! As the saying goes, big risk comes big reward. From my own personal experience, I have found that to be true also. Control the risk as much as you can, but know that sometimes you must take risk to get where you want to be. I love this story and that it happened to you at the young age of 23. I worked in a job I did not love for 10 years. After a few years it was just for the paycheck. I have since left that job and am now working for myself. I have not yet made what I used to make at my old job, but I am not yet able to work full-time either due to caring for young children. I am confident that next year, when I can move to full-time, I can match my salary from before or increase it. Just curious–were you immediately able to make as much on commission as you would have made as the administrative assistant? Honestly, I don’t really remember what the salary that was offered at the time. I’m thinking it was somewhere in the $30k range. If I remember correctly – since it was so long ago! 🙂 – I think I made about $40k in my first year after breaking off from him. Albeit more stressful that a typical salaried position, obviously it was well worth it in the long run. Rich Dad, Poor Dad was one of the first personal finance books I ever read and I should probably go back and re-read it. I’m glad you made the right decision. I think when situations like these come up we usually know what we want to do…the question is do we have the courage to take the chance and do it. It is always interesting to read these types of stories and see how people started out. Thanks for sharing! I made a big decision to move out of Metro Washington DC area which promised high paying jobs and lots of growth potential to move to the Florida panhandle to be closer to my family and escape the traffic and rat race that was DC. In the end I know I could be making more in DC but I am happier down here away from the crazy stress. I once made a dumb move accepting a job in which the details of what I would be doing and the project were still fuzzy, and the mission of what they were doing was something I did not believe in. I accepted the job because it paid $10,000 more a year, and then i realized what the disaster was that I got myself into. Luckily I was only in that job for about a year before another opportunity came knocking. I think I am coming up to one of those big decisions in the next few weeks. I am currently seeking new employment and I know I am going to have the option between two completely different positions. The first position is with the Government. I will be working clients (Government workers and military members) as their financial coach. I will be providing them with the education needed to survive the basics of personal finance. I know it will be a nice steady income and I can continue to work on the side. With the position, I know my wife and I would be able to settle down and buy a house, etc. The second position is with a highly successful financial planning firm. This position will be similar to your first year as a broker. I will be learning the ropes under the advice of a top financial advisor. However, I will be expected to branch out on my own within the next year. It’s scary. With this position, I don’t think my wife and I would be able to settle down and buy a house as there is more risk with this job. However, the longer term rewards are much greater. It’s going to be a tough decision! Enjoyed reading your story! The path to success is as individual as our fingerprints. Glad to hear you found yours. I whole heartedly agree with everything you said. The more you Follow your gut, intuition, etc.. the less regrets you will have.